The Man Who Invented Christmas It is no secret that I love to review Christmas Movies. I am especially fond of the Charles Dickens timeless classic A Christmas Carol, and have watched and reviewed most of the renditions. The Man Who Invented Christmas is not just another version of the Scrooge tale, but an actual journey into the mind of the man who wrote this best-seller. For those who are not familiar with the story, here is a synopsis: Ebenezer Scrooge is a money lender and a loner who does not believe in or celebrate Christmas. Because of this lack of belief, Scrooge is visited on Christmas Eve by four spirits; first by his deceased partner, Marley, and then by three other spirits, those of Christmas Past, Present, and Future. The purpose of the visits is to convince Scrooge to reflect on his life and behavior, experience redemption, and to emerge from the experience a believer in Christmas and a generous and changed man. 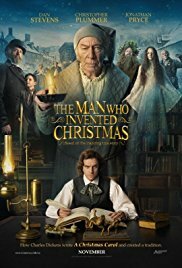 The Man Who Invented Christmas was a movie about Charles Dickens and his struggle to produce one of the most successful books ever written. Dickens was a celebrated and very successful British author, but had fallen on hard times with three straight flops. The bills to support his generous and extravagant lifestyle were piling up. He needed a quick winner to support himself, his wife and 5 children, and his recusant father. Dickens suddenly had an inspiration to write a Christmas novel. His regular publishers were not impressed, so Dickens struck out on his own to create his masterpiece, with a very tight deadline. Director Bharat Nalluri, known for Tsunami: The Aftermath and other TV and movie accomplishments, did a masterful job with this movie. He successfully created both a biopic and an intriguing tale of how the mind of a writer works. 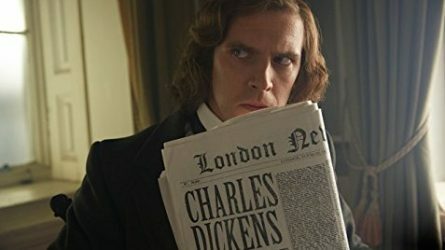 As Dickens (Dan Stevens) furiously brainstormed to try to meet the rapidly approaching deadline, story characters started to appear on the screen, visible only to him. The first character, inspired by an unintended visit to a graveyard and funeral, was Scrooge (Christopher Plummer). 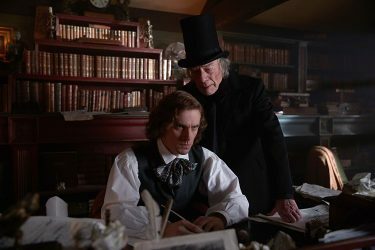 The first time Plummer appeared on the screen, it was instantly evident that he was Scrooge. Plummer was magnificent in his part. As the movie progressed other characters appeared with Scrooge, and Dickens drew inspiration from these apparitions. Not only was Dickens fighting a deadline, but he was battling with personal demons from his childhood. His father (Jonathan Pryce) had been sent off to Debtors Prison and the young Charles was forced into brutal child labor at a local Blacking factory. The fictional character of Scrooge and Dickens became more and more interlocked as the film progressed. This film created a immersive world of life in mid 19th Century England. The attention to detail of the sets was beautiful, but the office of Charles Dickens was stunning. The acting was fantastic and Dickens was surrounded by a cast of eccentric characters, some of his imagination and only seen to him. These interactions were the very essence of the film. Why was this film titled the way it was? Invented Christmas? According to the film and other sources, Christmas wasn’t widely celebrated in the 1840s. Apparently people were too busy surviving to do a lot of celebrating, which included a day off work. This was portrayed as “picking a mans pocket every 25th of December”. I don’t know how much of the film’s reference to Christmas was fact or fiction, but apparently there is a lot of truth in the concept that Dickens kick-started the holiday with his blockbuster book. “No one celebrates Christmas anymore” was uttered by his skeptical publisher when Charles Dickens presented his concept of the Christmas novel. I liked his movie a lot, in spite of the flaws. The flaws were minor and did not really detract significantly from the picture. There were too many flashbacks to the young Dickens. One scene would have been sufficient, we got it, he had a tough childhood and resented his father. Another disappointment was the setting. I missed the cold, dark, dreary and foggy London that is in virtually every other Scrooge movie. This movie was just too sunny and bright. The positives were great acting, and a really engaging and original take on this timeless classic. Except for Alastair Sim, Plummer looked and acted like the best Scrooge ever. I also really liked how the writer’s mind was manifested by the fictional characters that appeared. At first it was only Scrooge, but by the end Dickens had a crowded office when he had writer’s block. The use of former characters like Annette Badland as Ms. Feziwig was a pleasant surprise. The Ghost of Christmas Present appeared to be the same actor as in the Patrick Stewart version. He, unfortunately, was not shown in the credits. The Man Who Invented Christmas was a great change of pace for the Scrooge classic.